Registration is now open! 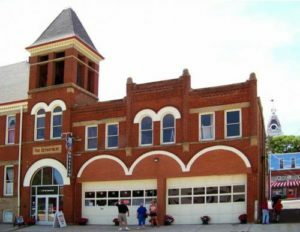 Pre-register (before June 8) for this year’s tour and save $10.00 on registration. Click here to download and print your information/registration form for Motor Tour 2018! You need not be a member of our Association to participate in our Motor Tour. 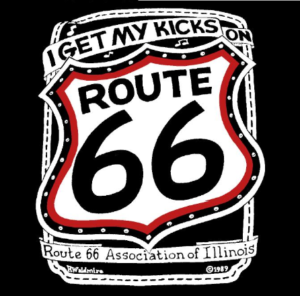 This year’s Tour progresses South to North along Illinois Route 66. 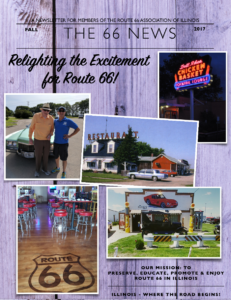 Registration forms will also be included in the Spring issue of our members’ only newsletter, The 66 News. 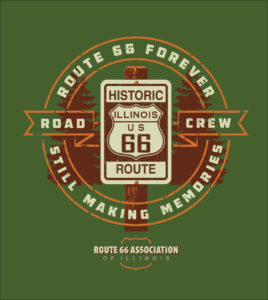 Saturday, June 9, morning DOUBLE CROSSING OF THE CHAIN OF ROCKS BRIDGE! Yes, you heard that right – we’ll cross from East to West, then turn around and go from West to East along this iconic bridge! Association President, Cathie Stevanovich will call the start of this event. Not in the memory of anyone we can find has this been done before! There will be a nominal crossing fee and a time limit that the bridge will be open for this special double crossing. From this crossing, the Saturday leg of our Motor Tour will commence. 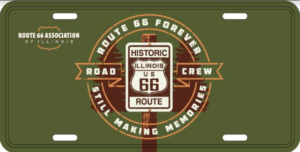 Each car registered for the tour receives this collectable aluminum license plate plus a passport, decal and dash plate! Our Hall of Fame and Museum Have Reopened! We’re back up and running with heat! Thank you for your patience with our recent, unexpected closure. 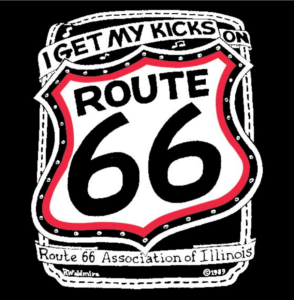 Come in out of the cold and experience a truly unique Route 66 collection at our Route 66 Association of Illinois Hall of Fame and Museum in Pontiac, Illinois! 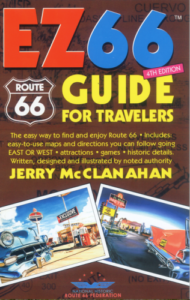 We are sad to report the passing of a true Route 66 enthusiast. 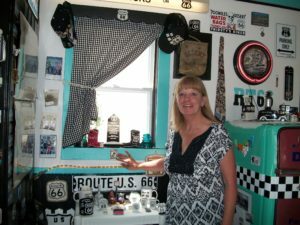 Dawn Patterson, of Towanda, who turned her 2 car garage next to her home in Towana into a “66” tourist destination, passed away on Tuesday, November 14 after a brief illness. Dawn was born August 7, 1958, in Streator, the daughter of Allen “Pat” and Dagny Lund Patterson. She grew up in Dwight and graduated from Dwight High School in 1976. She is survived by her best friend and sister, Lisa Golding; sister-in-law Kathie Delong Patterson; and a sister, Gail (Bob) Ricketts; as well as nieces, nephews, and great-nieces and nephews. 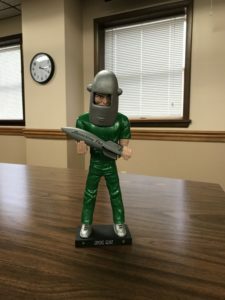 Dawn worked nights at State Farm – she was that friendly voice that helped you when you were in trouble or needed to research your car insurance. Dawn retired from State Farm after 19 years in September 2016. If Dawn’s garage overhead door was open – you were welcome to stop and visit!! 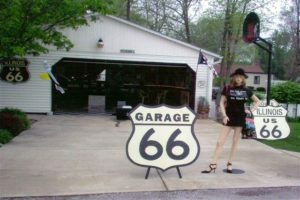 Her garage was a wonderful 66 inspired place where she displayed gifts she had received from friends and travelers, and also sold Route 66 trinkets and even had her own “DK’s Garage” t-shirt! 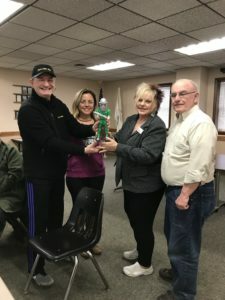 Dawn would sit at an old retro kitchen set as people wandered in and out, signed the guestbook, and posed with her shapely mannequin “greeter.” She knew a lot about the road and often helped people with their lists of what to see and where to go in other states. 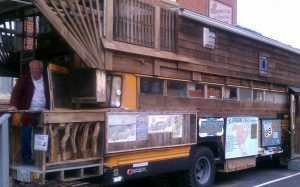 During past Red Carpet corridor events, her garage door was not only open, but often the band “Wagon Load of Trouble” would grace the driveway for entertaining! Dawn was a gracious hostess and loved the interaction she had with 66 travelers whether they were from Bloomington-Normal or Finland! garage as strangers and left as friends. Dawn closed her garage in May 2017 and spent the months after that selling off her souveniers and keepsakes. the World Series. She was also a huge Miami Dolphin fan. There was no memorial service or wake. Memorials may be directed to Lisa Golding, P. O. Box 76, Towanda, IL 61776 or the charity of the donor’s choice. Submit Content for the Winter issue of The 66 News! 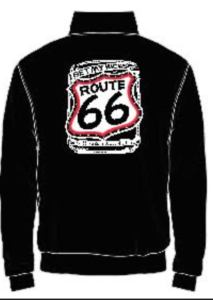 Editor Gina here reminding Association members that the submission deadline for the Winter, 2017 issue of our members-only newsletter, The 66 News, is approaching. Please submit your stories, travelogues, photos and news by November 15. For your information, here are my guidelines for photo submissions to maximize their quality in print. I look forward to reviewing your submission! If it doesn’t get included this time, I’ll save it for future consideration!